It was a great privilege to be able to spend time over four days listening and talking to Iain McGilchrist whose breadth of knowledge of science, history, literature, art, poetry and music is so impressive. It is rare to attend a course where the latest in scientific research, in this case into the functioning of the left and right hemispheres of the brain, is integrated so effortlessly with the words of William Wordsworth and the art of Claude Lorrain and much more. The course provided in depth information about the work of left and right brain hemispheres, whilst also allowing us time and space to reflect deeply on our views of the world and the implications of left hemisphere dominance for our humanity, health, happiness and well being. Over the next few posts I hope to capture some of the ideas that we discussed over the four days and my reaction to them. So here is the first post following the first session. 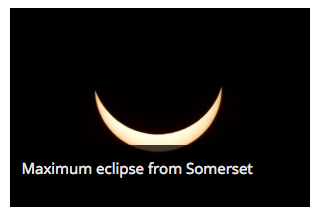 The day started with seeing the solar eclipse which looked, in terms of shape, pretty much like this image below although we just saw it through a gap in the clouds and my view was of grey cloudy skies, a grey moon and a white sun. Iain McGilchrist started his talk by telling us that we were about to enter a cloud of unknowing where everything we knew would be eclipsed by what it means to come into being. This was said a bit ‘tongue in cheek’ but was meaningful nevertheless. He started by telling us a little about his background, his education in philosophy, English literature, medicine and psychotherapy, his interest in history, music, art and poetry, his work in a London hospital, his life on Skye, his writing. Iain talks fast and like his book the content of his talk is densely packed. I noticed that some of the 23 delegates in the room took no notes at all. I wondered what they would remember. For myself I tried to take down the points that seemed salient to me, but only captured a fraction of what he said. I have already reserved a place on next year’s course. Perhaps I will capture a little more next time round. Here are the notes I took in this first session. Reading back through them I can see how meaningful they are to me, but for the reader will probably appear arbitrary since they are out of context (great stress was laid on the importance of context, in this course), and also reflect a personal selection and interpretation. These notes are not what Iain said, but what I thought he said. A recurring theme through the four days was that the sum is greater than the parts. The experience of listening to a piece of music, such as Wagner, is much more than knowing which instruments are being used to play which notes in which combination. When a musician performs a piece of music, he is no longer thinking about individual notes. When an actor is performing we are no longer conscious (if he is good at what he does) of the actor, but are convinced by the character that is being portrayed. There is nothing that goes on in us that is not embodied. Language defies us. Once you make the implicit explicit, it loses meaning. (This caused me to reflect on the value of close reading poetry, which is a central activity in some poetry courses, e.g. ModPo) It is not just the words, but the ‘way’ in which things are said that gives meaning. The tone of voice, irony, metaphor and humour all come from the right hemisphere (RH). The mind-body relationship was also a recurring theme through the four days. Another recurring theme was the idea of inhibiting things as being enormously creative. The business of living is one of losing brain neurons. We have more brain neurons at birth than ever thereafter and life is a process of ‘sculpting’ the brain. The process of sculpture as one in which we need to lose material to reveal the creation, creates a strong image for me. There is also something important about keeping things apart. There are incompatibles in the brain which need to be kept apart. This function is served by the corpus callosum, the main band of neural tissue that connects the two hemispheres at their base, but also inhibits connections and stops the hemispheres from interfering with each other (see p.17/18 in the Master and His Emissary), but the corpus callosum is getting smaller with evolution and it is worth considering the possible implications of this. The session then moved on to consider how the two hemispheres do things in different ways, with the left hemisphere (LH) being the hemisphere of doing and the RH being the hemisphere of being. The details of these different ways of viewing the world can be found in Iain’s book (2010) and I have blogged about them before. In this session the LH was discussed as being manipulative, seeing things as decontextualised, inanimate, abstract, the hemisphere of narrowing down to certainty, stasis and the familiar. The RH was discussed in terms of understanding, seeing things in context, open to possibility, being animate, in flow, unique, new and embodied. But the LH and RH need to work together to achieve a balance. 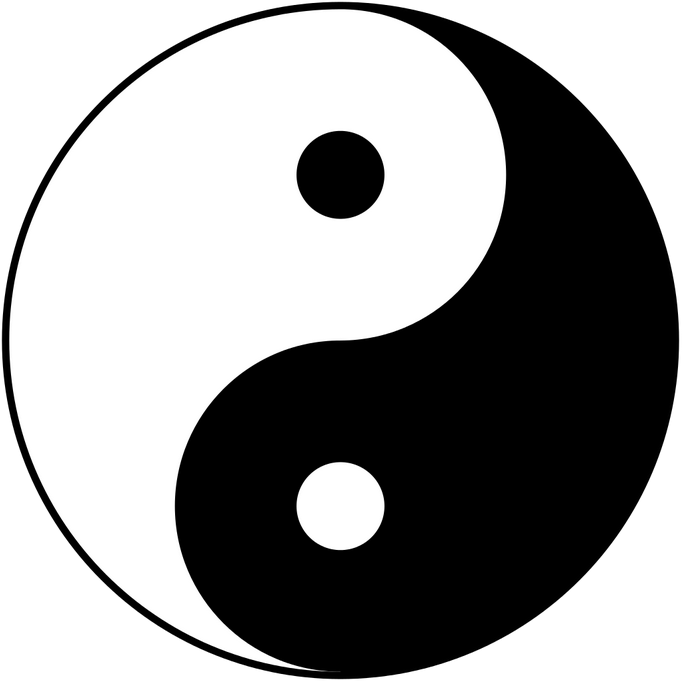 They can be represented by this Yin Yang image. There is not an absolute dichotomy between the LH and RH, even though they are anatomically and genetically different. The RH and LH have different views of the world. We change the world according to how we attend to it. We filter out and create. We never just ‘see’; we ‘see something’. We have to make judgments to make a choice, which means that we blot some things out. We see according to our frame of reference and we get information according to what we are expecting to find. This means that we can become stuck in the hall of mirrors of the left hemisphere. A hall of mirrors was an important image for this course and was related to a left hemisphere world as being one that looks much like schizophrenia. Schizophrenics often have no RH function or RH failure and the link between madness and modernism has been written about by Louis Sass. Oliver Sacks (1973) Awakenings. Vintage Books. Louis Sass (1994) Madness and Modernism. Insanity in the Light of Modern Art, Literature and Thought. Harvard University Press. Mihaly Csikszentmihalyi (1990) Flow: The Psychology of Optimal Experience. New York: Harper and Row. Previous Article February 2015. Light and Shade. Hi Rhonda – No it wasn’t me that added it. Iain used it in his talk 🙂 I will be writing more about the course. We had Iain talking to us for at least 4 hours each day – so you can imagine how much there was to take in. The value of just doing a New Criticism close read is limited….as is every other litcrit stance, but the serious task is to stand in different places and rotate the poem, even from the inside looking out. It is the striving to make the inside larger and more complete than the outside that inspires me and that I think is implied by McGilchrist. His ideas are humbling yet very helpful. Thanks for the summing up. Now I gotta go back and reread. We ought to do a reading of this book via Kindle comments. Hi Terry – thanks for your comments. I have been thinking about close reading since I have found it very helpful as an introduction to poetry and it is the approach used by the ModPo MOOC, which I think does a great job of opening up poetry for those who are new to it. But I can also appreciate your point. Iain McGilchrist read quite a bit of poetry during the course and ended on the last day by reading from his favourite poem by his favourite poet – ‘Tintern Abbey’ by William Wordsworth. It made quite an impression. I didn’t know there was such a thing as Kindle comments so thanks for that, but having discussed this book online with a friend for more than 3 years, I can now see how much more I can understand when physically in a room with other learners and particularly with the author. Of course the 3 year discussion made all the difference to what I could understand, but I also learned so much in 4 days that has taken me so much longer online. Hope that makes sense. Thanks Jenny – wonderful thoughts – and I know I will benefit from this course that I didn’t attend. Just thinking about “It is not just the words, but the ‘way’ in which things are said that gives meaning. The tone of voice, irony, metaphor and humour all come from the right hemisphere (RH). The mind-body relationship was also a recurring theme through the four days.” and how that applies to a speaker and a listener in shared but different contexts. I’m thinking about the speaker using irony (say) and how the listener interprets that. Thanks, just thanks. Thank you Frances. I’m so pleased that these ideas also ‘speak to you’. I can see many overlaps between these ideas and the topics that we have been discussing for many months now. There was a lot of emphasis on what it means to ‘listen’ in the course. Many of the course participants were very experienced coaches – that was their profession – so you can imagine that they were focussing on the mind-body relationship and how to ‘listen’ to their clients. Reblogged this on My DALMOOC Blogsite. @jurnal – Thank you. I have a few more posts to write and then I will start to try and do some wider reading. Since you have read the book twice – please do add any comments/information you think relevant or correct any misconceptions I might have.